Every day I receive a barrage of pitches for event technologies. Each one markets digital tools, like apps for marketing, registration, venue booking, staffing, sponsorship, engagement, etc. Newcomers to the meeting industry who experience this onslaught could be forgiven for believing that digital software and hardware technologies are the only tools available and worth considering for meeting improvement. The reason that digital tool marketing fills event professionals’ mailboxes and feeds is simply that there’s money to make by selling these technologies. Much more money than from tools like the participation techniques covered in my book The Power of Participation, which require either no “technology” at all or inexpensive tools like paper, Sharpies®, and Post-it® notes. Yes, digital event technology has had a big positive impact on events. For example, no one (except the companies that printed them) regrets the demise of the massive printed conference guides that attendees had to drag around, most attendees appreciate the quantity and timeliness of information available on their mobile devices from well-designed event apps, and voting apps and throwable microphones allow greater interaction between presenters and audiences. Nevertheless, in my experience, the human process tools I’ve been using and improving for the last twenty-five years provide more benefits more effectively (and, obviously, at lower cost) than current digital tools. Let me illustrate with a current story taken from one of my earlier careers. Before accidentally entering the meeting industry, I spent twenty-three years as an independent information technology consultant. During this period I was an active member of the global software development community and my friends included some of the leading practitioners of this challenging art. Large software projects involve teams of programmers who work together to develop complex systems where a single error can have far-reaching consequences. Everyone makes mistakes, and one of the hardest tasks when developing software in teams is to implement design process that provides the required system functionality while minimizing flaws. Because the system implementation is constantly changing during development, continual software testing is an essential component of the whole process. As you might expect, software developers are leading-edge creators of software tools. Sophisticated code repositories, automated testing suites, and complex project management tools are routinely used and constantly improved. And yet, it turns out, some of the most important tools are not digital. 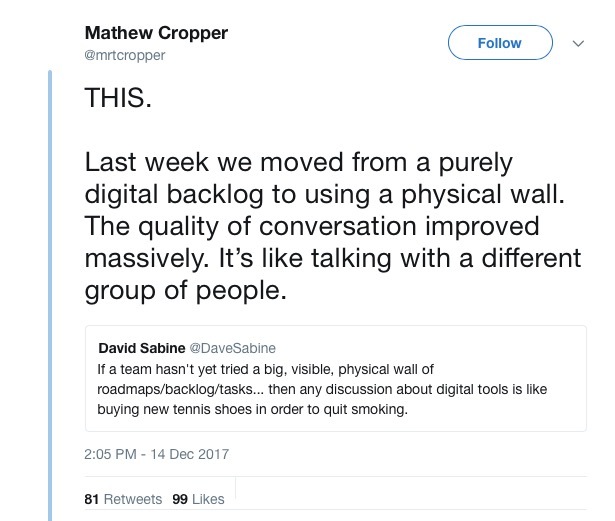 Here’s an illustrative tweet from Mathew Cropper, an Irish software developer, and a follow-up response from Canadian consultant Dave Sabine. The most sophisticated digital tools that money can buy are no match for a wall full of sticky notes! A natural focus for easy spontaneous conversation, communication, and creativity. Information capture: Wall requires writing with pens on sticky notes. Digital tools require access to a digital device for each attendee plus the interface knowledge necessary to use it. Public display: Wall requires a flat surface for notes. Digital tools require a BIG (expensive) screen. Document and discussing progress & implementing process: Wall layout can easily be repurposed/redesigned whenever needed to accommodate different process tools such as project management or ranking to-dos. Digital tools typically require specific process techniques to be precoded. Focus for conversation, communication, and creativity: Walls provide all the above functionality simply and in ways accessible to any attendee. So they are natural foci for conversation, experimentation, and creativity. The barriers listed above for digital tools make them far less accessible for such purposes. 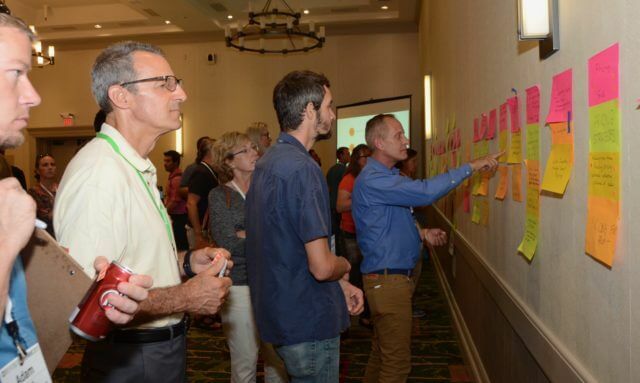 Given these significant advantages, coupled with much lower costs, it’s a shame that more conference organizers haven’t discovered the value of simple process tools like sticky note walls and are still seduced by the relentless marketing of digital tool suppliers. So to learn more about many other powerful human process tools and how to use them effectively, buy my “tool chest” book The Power of Participation: Creating Conferences That Deliver Learning, Connection, Engagement, and Action.